Like us even more on Facebook! Tide times tweeted twice a day? Terrific! 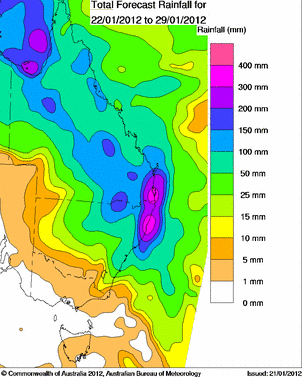 Forecasts for a wet week is still on the cards with rain starting on Monday with Australia Day celebrations looking like they'll also be rained out. Over the next four days it'll get progressively wetter with Tuesday and Wednesday likely to receive falls of between 50-100mm on each day. 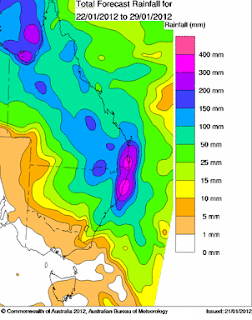 Longer term computer generated forecast maps still has high rainfall totals of between 300-400mm estimated over the next 8 days for south east Queensland and northern New South Wales, but it's not as high as the 400mm+ as per yesterday's images. The Bureau of Meteorology has not issued any Severe Weather Warnings, but if any further information comes to hand we'll post it up for you here, on Twitter and on our Facebook page. Showers tending to rain periods.